3. Significance of derby name/#: Jurassic Park has been my favorite film since the age of 8, when I saw it in theaters about half a dozen times. I had JP everything in school after that- backpacks, pencils, folders, POGS, you name it! 5. Position you play: Jammer, Pivot mainly. 6. How long have you been skating? This is the start of my 3rd season! 7. How did you join derby? My derby wife Dannie Stormborn asked me to take rollerskating lessons with her and the rest is history. 8. What do you like most about derby? The camaraderie. 9. Greatest strength on or off the track: Hmm, probably my footwork? Derby aside, I just really enjoy skating. I love learning new stops, new agility, stuff like that. 10. Derby injuries: Severely sprained ankle in my first year during a tournament, knee contusion in my second year during a game. Hoping for a less eventful third year, lol. 11. Favorite derby memory: Probably my third game ever as a rostered skater with The Revolution, but it was also first ever away bout. We only had 10 skaters, three of which were super fresh- myself, Stormy and Super D. The stats predicted our loss, but we ended up winning by a very small margin. It was one of those games where the lead changed every other jam, real edge-of-your-seat stuff. It was particularly memorable, though, because for us newbies, we played just as much as our veteran teammates, and usually that doesn’t happen. I jammed my first power jam and racked up some decent pointage, I received my first star pass as a pivot successfully and was able to score, and the vets trusted me as a blocker in their experienced line ups. I remember coming off the track and handing the star back to our Bench Coach at the time and I remember her smiling and telling me how proud of me she was. On the bus ride home one of our Captains told us (newbies) that if there were any doubt of the three of us making the roster that year, that our performance and teamwork that day proved that we earned our spots on that team. It was just an amazing day, we got on the bus at 7am, unsure and nervous as hell, but we played our hearts out and we were so proud and full of derby love by the end of it. That’s what I mean about camaraderie being what I love most about derby- having teammates that build you up and believe in you when you don’t even believe in yourself. 12. Favorite foods/drinks: Popcorn & Pizza! Unsweetened ice tea with lemons and iced coffee! 13. Anyone you look up to in the derby world? 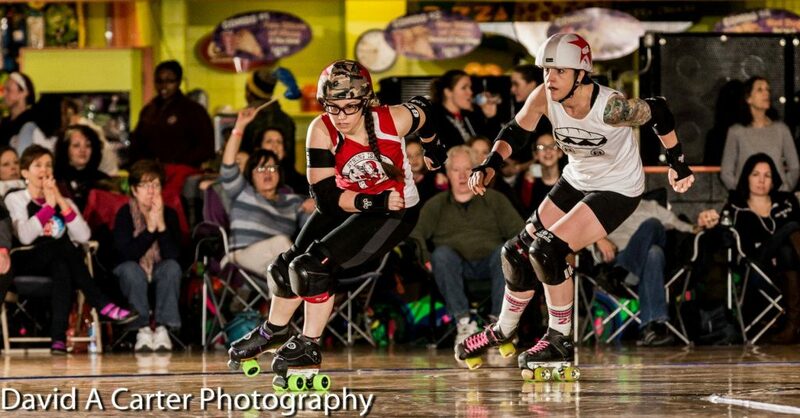 I want to backwards block like Biceptual from Victorian Roller Derby League! 15. Who is the most challenging player you experienced? People are challenging in their own ways, this is a pretty broad question, but most recently I would say #109 from Pioneer Valley. Trying to backwards block her while she was jamming was like stepping in front of a freight train! She gets super low and leads with her shoulder. One jam we both got so low her shoulder made contact with the inside of my bicep and my arm went dead immediately! That was the worst bruise I've ever gotten playing derby and lasted about a month! 16. Do you play any other sports besides Roller derby? No other organized sports, but when it finally snows I'll be learning to ski this year! 17. What personal advice would you give young derby beginners? I've been telling newbies this since I graduated from newbie-hood: Attitude is everything. Everyone's skill will develop in different ways, at different rates. I remember my derby wife picking up plow stopping almost immediately and I struggled with it for weeks until I nailed it. The opposite was true with the two of us for t-stops. As long as you have a positive attitude and always try what your coaches ask of you to the best of YOUR individual ability, you'll always do well. It's okay to get frustrated once in awhile, it happens to everyone! But as long as you're trying and you have a good attitude it will make all the difference! 18. When and what occasion was a specific moment you felt like you really had to push yourself even harder? I took three speed skating classes this past summer at Gotham's crash pad in Brooklyn. It was taught by an Olympic speed skater and was open to anyone who was bout eligible. One of the classes included Bonnie Thunders herself! The classes were three hours each- 1 hour on skates, 1 hour off skates work out and then another hour on skates. It was hard endurance work but damn, if I didn't feel like I could conquer the world after each class! 19. Hobbies outside of derby: Crocheting, finding new food spots, attempted ice skating last year, would like to make that more of a hobby this year.